Based on the true story of the real Florence Foster Jenkins who, at the age of 76, sang at Carnegie Hall on October 25, 1944, in spite of being (so-called) “the world’s worst singer.” Comical, touching, and oddly uplifting, the film introduced me to this very wonderful and peculiar bit of musical history. One of the interesting parts of the story for me was that Florence apparently had no idea she sang so badly. She knew that she loved it, and she was certainly well-loved herself (both by those who knew her well and by her fans—I gather from the film, at least, that this was largely a consequence of her magnanimous personality). Her record, produced at her own expense, would become Melotone Recording Studio’s #1 selling record, and the recording of her performance at Carnegie Hall in 1944 is one of the most requested of all time. Meryl Streep was wonderful, even though my favorite of her roles is still (and may always be) Julia Child in the dual-biographical feature Julie and Julia. The crowning jewel of the movie for me, however, was Simon Helberg’s performance. I’m pretty sure I could watch the scene of him laughing in the elevator a thousand times—-I may watch the whole movie over again just for a handful of his scenes. 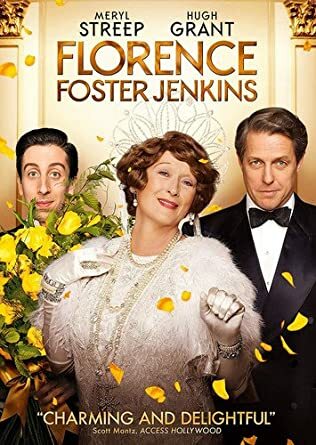 Best known for his role as Howard Wolowitz in Big Bang Theory, I thought Helberg absolutely shone in Florence Foster Jenkins. Altogether, it was a pleasure to behold: a slow movie, but worth seeing!